Michael Rother, a former member of three of the most influential German bands (Kraftwerk, Neu! and Harmonia), is one of the justly renowned members of the current 'krautrock' revival. David Bowie (who he turned down for work) and Brian Eno (who he didn't) among others have been among his fans. The Neu! catalog is in the process of being legally reissued (it's now out as bootleg imports) so that some of Michael's greatest work can be heard again all over. Happily, after going on his own for a solo career, he found that his gentle, melodic work was well-accepted. In addition, a Neu! tribute CD is going to be out soon with a contribution by Michael (and liner notes from PSF) as well as Autechre, System 7 and Legendary Pink Dots. Another measure of the influence of Michael's work has been on non-participants who themselves had been very influential to others: Sonic Youth (who named a song after Neu! ), Stereolab (who sound like Neu! tribute band at times) and Negativland (whose name and record label came from Neu! songs). Special thanks to THOMAS ZIEGLER for being tolerant, helpful and having a good sense of humor. 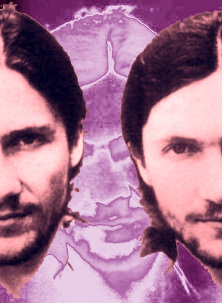 NOTE: MICHAEL ROTHER - CHRONICLES I is out on Cleopatra now. On June 2nd, they will also be releasing A Tribute to Neu!. PSF: What kind of music were you doing or involved in before Kraftwerk? Before I joined Kraftwerk in 1971, I played guitar in a band called Spirits of Sound, whose members included (at times) amongst others singer Wolfgang Riechmann (Sky Records released his only solo album Wunderbar shortly after his death in 1978) and drummer Wolfgang Flür (later on Kraftwerk, now solo). The music of S.o.S. in the mid 60’s first was the English pop and rock music of the times (Beatles, Kinks, Rolling Stones ). As a fan of those bands and the guitar players Harrison, Clapton, Hendrix I learned the basic concepts of pop music by imitating their ideas. As a self taught artist I had no musical education whatsoever, apart from listening to the piano my mother (who had a classical training) played and I am quite sure that I picked up something unconsciously and internalized it. S.o.S. developed in the course of time and so did my musical ideas towards independence. The development of my own personality demanded to create something individual. Imitating or interpreting other musician’s ideas wasn’t satisfactory any longer and that is why the English pop & rock music clichés had to be abandoned and overcome. PSF: What was the German music scene like at this time (late '60's)? Back then and later on when I was in NEU! and Harmonia I was too much preoccupied with my own music to be aware of the German music scene, let alone following it actively. But changes which were happening with S.o.S. (namely the development of individual ideas and the effort to distinguish from the Anglo- American rock patterns) also helped me recognize other musicians within my immediate vicinity. In Europe it was the time of huge social disturbances, political demonstrations (Berlin, Paris, Prague), the reflection upon overcoming of existing structures in general and the desire for a new beginning. In German politics this was symbolized in the person of Willy Brandt (overcoming of the east/west conflict, reconciliation with the victims of the Nazi dictatorship). The Vietnam war and the radical arguments in the U.S.A. also had a strong impact on us. Jimi Hendrix, who "burned off" the American national anthem in Woodstock with his guitar was one of the biggest musical experiences in my life. This Zeitgeist is reflected in our music. PSF: How did you get to work with Florian and Ralf (Kraftwerk)? Could you talk about the work you did with them? As a conscientious objector I did my community service in 1971 in a psychiatric hospital and a friend there, who also was a guitar player, invited me one day to join him recording film music with a band named Kraftwerk which I didn’t know at the time. I came along and jammed at this session together with Ralf Hütter and a drummer (I believe his name was Charly Weiß). Florian Schneider and Klaus Dinger were present as listeners and everybody liked the spontaneous music we did together. Ralf and I immediately clicked, we exchanged phone numbers and a few weeks later Florian Schneider and Klaus Dinger called me and asked, if I was interested in working with them as Kraftwerk. A little earlier, Florian and Ralf had separated and Florian wanted to take the Kraftwerk concept into a live project, since the first album had been released and success was increasing from week to week. Initially there were five musicians, but soon after the line-up was reduced to the trio Schneider/Dinger/Rother. In the period following there were exciting months of many concerts (occasionally together with Can), festivals, TV shows (e.g. ‘Beat Club’) and studio recordings for the second Kraftwerk album with Conny Plank in Hamburg. The music with Florian and Klaus was radical and "primitive" in an exciting way, i.e. absolutely spare and at times brutal. The live shows on were sometimes really intense, both for the audience as well as for us. I remember the feeling of riding on a big wave and being thrown forward. It is very hard to describe that feeling, but it definitely had something magic. The collaboration of Schneider, Dinger and myself very often was anything but relaxed. An unbelievably strong state of aggression sometimes prevailed between Schneider and Dinger, which made me very much dissatisfied and unhappy. After learning that we couldn’t realize the live magic in the studio and therefore breaking off the studio sessions with Conny Plank, we went separate ways. Klaus and myself decided to keep on working together in a duo called NEU!. PSF: How did you and Klaus decide to work together to do Neu! ? Was there any plan or idea behind the group ? After the split of Florian and Kraftwerk it was obvious for Klaus and myself to realize our ideas together. With Conny Plank as co-producer we rented a studio and recorded the first album in 4 nights (the studio rate was cheaper at night). Almost everything happened spontaneously, beforehand Klaus and I only had roughly sketched ideas, melody, sound or instrument ideas, which only were put in concrete form in the studio. With NEU! there wasn’t a pre-phrased concept in theory, which was to be transformed into music, but the music was always kept together by the spontaneity and emotionality. Our experience from the live shows with Florian certainly left their marks, too and in addition the financial scale (we were broke) forced us to work quick and spontaneous. Klaus and I always had completely dissimilar characters and temperaments. His background was being a drummer and he laid into that drumkit like nobody else I ever knew. At some shows blood splashed, when Klaus hurt himself with a broken cymbal. The audience was very much impressed by this radical and ecstatic performance. I never felt the need for this kind of performance and always tried to come across with just the music. So I sat behind my few effect devices and pedals and focused on the developing music and not so much on the audience. In good moments the opposite worlds of Klaus and me came together at our recordings, with the help of Conny Plank, which should not be forgotten. I guess the tension of bringing together incompatible elements is what is fascinating people with NEU!. PSF: What kind of influence was Conny Plank on work that you recorded with him? Conny Plank had a lot of enthusiasm and understanding for our music, which was something rare at the time. He had a share in the financial risk with our first production and due to his personal authority, he was a most respected co-producer in the studio. Apart from his manual skills, Conny had a tremendous sensitivity for the music and psychological fine feeling, which especially in the case of Klaus Dinger and myself was absolutely necessary. In the course of the years we learned a lot from each other, at least I learned a lot from him. With my first three solo albums it happened quite often, that Conny with his first run of the mix (which he did when I left the studio on purpose to turn my mind off) came very close to what I had in mind. It was amazing, how precisely Conny sensed our ideas and in critical situations he helped me in an unobtrusive and effective way. PSF: Could you talk about the first (self-titled) Neu! album? How did that come together with you, Klaus and Conny? Do any of the songs hold special meaning? We knew Conny from the Kraftwerk recording sessions, so that provided a collaboration. As to the personal special meaning of the songs: Each composition, each title has an emotional past history and quite often this is pretty confused and it is not a simple task to name it. I can’t and won’t speak for Klaus, and as far as I am concerned, the following answer has to be good enough: I always understood and used music to express my deepest feelings. If music was just an intellectual exercise without this deeper meaning, it would not have any importance in my life. PSF: Is it so that you ran out of money for the 2nd album so you had to do remixes of certain songs? The situation which led to the radical B side of the second NEU! album was the following: We had rented an expensive studio and had already spent a lot of time and money with the tracks which turned out to be the titles for the A side of the album. This probably was partly due to our desire to show more details than on the first album, but also a sign for a weakness in orientation (which shortly after led me to find a new way, a new musical approach with Harmonia). When we realized how expensive the production would be if we went on with the same speed, i.e. the advance from the record company wouldn’t even be good enough to cover the studio rent, we knew that something drastic had to happen. Klaus and I had recorded the single "Super/Neuschnee" a few months earlier and we were not happy with the sales figures and felt, that those two tracks were sort of wasted. So it suggested itself to release those songs again on the album. Klaus then started to "treat" the record-player in the studio, the titles we had recorded already were extremely alienated by mixing them again and again. I had a cassette recorder which used to eat the tape and howl really bad, but in the context I really liked it - this is how "Cassetto" came about. Since then listening habits changed towards this direction, but in 1973 a lot of critics and fans were irritated and felt as we had made fun of them, which wasn’t intended by us at all. In retrospect some material of that B side of NEU! 2 features the most interesting music, NEU! ever made, although you can’t listen to this material on a daily basis. PSF: Did Neu! do many live shows? If not, why do you think this was so? We didn’t succeed with the attempt to transfer the NEU! music from the studio to the stage. First Klaus and I did concerts in twos in which I used pre-recorded material from a cassette recorder. In the studio I had recorded additional bass, guitar and other sounds and I was trying to manage to get a similar sound impression as in the studio. This procedure, which nowadays is very common, was then unknown and completely frowned upon. It was considered dishonest to work like that, but apart from the lack of appreciation from the audience, it wasn’t a lot of fun, because a cassette recorder - compared to today’s use of samplers - just wasn’t flexible enough. So Klaus and me tried to integrate other musicians in our concept of performing live. But then it became apparent, that others didn’t understand or comprehend our musical ideas of how NEU! music had to sound. So, after doing a few concerts with Uli Trepte (Guru Guru) and Eberhard Kranemann (Kraftwerk, Fritz Müller) we were pretty frustrated and by the end of 1972 we gave up on our plans of performing live. PSF: Why did Neu! go on a hiatus after this? How did Harmonia come together? The first NEU! album was released in 1972 on United Artists in Great Britain and was, like in Germany, an immediate success. United Artists wanted us to invite to tour England in the beginning of 1973 and we started again to think over a solution to the problem of live performances. I already knew Cluster musicians Hans- Joachim Roedelius and Dieter Möbius, I really liked the title "Im Süden" from the second Cluster album. So I figured Achim and Möbi might be a good reinforcement for NEU! live performances. I took my guitar, drove to the Weserbergland Easter 1973 and Achim Roedelius and me improvised in the studio. Apart from the fact that I was fascinated by the whole ambience (I am still living there), this encounter was a musical discovery, which suddenly meant a lot more to me than the continuation of the NEU! concept. Achim Roedelius and Dieter Möbius also were convinced of our collaboration, so in June of 1973 I finally moved from Düsseldorf to the Weserbergland and we founded Harmonia. PSF: How did your work with Cluster and Harmonia have an effect on your own work / writing - playing? It is hard to tell, which experience has a specific effect on oneself. All I know is that I cannot imagine my development, not just the musical one, without the experience of living together and working with Harmonia. This is where I found the depth and magic, which I missed in my recent work with Klaus Dinger. Turning to more free and more silent sound experiments was as important as the musicians Möbi and Achim, whose personalities I got to know during this period. It was only working with Harmonia that I could move on and develop and this enabled me later on to compose titles such as "Isi", "Seeland" or "Flammende Herzen." PSF: Brian Eno seems to have been a big fan - could you talk about your work with him? What did you think of his own work at the time (Another Green World seems heavily influenced by Harmonia)? In 1974 Brian Eno came to a Harmonia concert and we liked each other immediately. He wasn’t at all the eccentric pop star you might believe him to be from the Roxy Music era. Everybody in Harmonia was really fond of the first Roxy Music albums, but we didn’t want to draw from those for our own music, we just like to listen to them quite often. We also checked out Brian’s first solo projects (Here Come the Warm Jets and No Pussyfooting - with Robert Fripp), but I never really liked them a great deal. Brian’s later albums (Another Green World, Before and After Science etc.) I liked a lot. But I always had the rule, that my own work shouldn’t possibly be influenced. Especially during periods, when I work on new music, I barely listen to anything else, at least not from the pop music world. But of course an exertion of influence never can be ruled out, even if it is not desired. Brian often enough explained to us and journalists that he knew the "new music" from Germany back then and that he liked it a lot (Can, NEU!, Cluster, Harmonia, Kraftwerk...), but I don’t want to speculate about a possible influence, that his preoccupation with our music might have had on him. Fact of the matter is, that nobody lives by himself on an island and creates his music out of a vacuum. And this applies to all of us. The meeting with Brian led to the sessions in the Harmonia studio in 1976, out of which recently the album Harmonia 76 - Tracks & Traces has been released. It was a very special experience to listen to that music after all those years and to realize how fresh I emotionally had kept it in my memory. The relaxed work with Brian was very exciting and productive for all of us. PSF: How did Neu! get back together for Neu! ‘75? How was this different from the older band? Was material recorded for another album? What was this material like (maybe very different than other Neu!)? NEU!’s recording commitment with Brain/Metronome was three albums. In order to fulfil this contract and because I felt a musical interest working again with Klaus Dinger to realize certain ideas, which weren’t possible in the Harmonia context, I composed some tracks and Klaus and Conny Plank went to the new Conny Plank Studio in 1974. It was my agreement with Klaus, that we would record one side of the album in the classic NEU! style just the two of us, and the B side would be recorded in a four piece band, in which two drummers would take over Klaus’ drum part: Thomas Dinger, Klaus’ brother and Hans Lampe, who had worked as an assistant engineer with Conny Plank. Klaus back then insisted on performing live and for this purpose he had trained both of those musicians with his style. For me this line-up wasn’t musically satisfactory for a live performance, but in the studio we did alright. "Hero" is one of my favourite NEU! tracks (when I am in the mood). After recording NEU! ‘75 I moved on with Harmonia and Klaus started his project La Düsseldorf, still working with both drummers. David Bowie never made his enthusiasm for NEU! a secret, that really speaks for him, although I found it kind of odd, that he quoted our title "Hero" (which was one of his favourite tracks at the time, as he once explained in an interview) for his album Heroes. In 1977 Bowie asked if I was up to participate in his new album, which he recorded with Brian Eno in Berlin. Back then my first solo album Flammende Herzen had just been released and was a major success in Germany. We never ended up working together, one might speculate about the reasons. I once told Bowie and his manager that I could imagine me participating in a more experimental and silent music like on the B side of Low and less in a rock oriented project. I think the management and the record company wanted to see Bowie change to a rock music sound for commercial reasons. It only came natural for me to work alone in 1976 after the successful, but also very exhausting collaboration with Klaus in NEU! and after the end of Harmonia. At least then the concept of both of those bands seemed to be exhausted. I wanted to realize my ideas without compromises and find out, what kind of music would (with the support of drummer Jaki Liebezeit and co-producer Conny Plank) come out of this. PSF: How was your solo work different from what you were doing with Neu! ? Based on an understanding of the group concepts of NEU! and Harmonia as the meeting and reacting people with each musician bringing in his own artistic identity in the joint music, it is evident that solo work always appears more unified, with all possible advantages and disadvantages. The enormous tension that prevailed in NEU! was a special fundamental basis which is reflected in the music. Even I feel tension in myself, which is expressed in my solo music, maybe the listener has to keep track of the nuances to a bigger extent. At any rate working as a solo artist comes pretty close to the working method of a writer or a sculptor. You have full control over the work to be created, but you also carry the psychological burden and the responsibility all by yourself. In a band everyone is taking the part of the active person once in a while to help someone else to overcome a hurdle or blockade. That’s how it worked in NEU! and also in Harmonia. PSF: How do you look back at the work you did With Neu! ? What do you think of the music now? NEU!’s music will always ("für immer") be a part of me and I absolutely stand to what we’ve created. Of course I have changed since and I judge my contributions to NEU!’s music of the 70’s in a historical context. They were both a description of my feelings back then as well as an expression of my musical abilities and limitations. It would be a mistake to ignore the time factor and it would be an artistic shortcoming to pick up on the old concept without doing any changes. There is no way this is going to happen anyway. During the recording of my contribution to the A Homage to NEU! compilation which I called "Neutronics 98 (A Tribute to Conny Plank)" I very much enjoyed dealing with the NEU! concept and feeling and mixing the track reminded me of working with Conny Plank. The situation with Klaus has been tense since years, because he has been blocking all constructive attempts at re-issuing our NEU! albums. Instead of releasing NEU! music in a joint effort with me, Klaus preferred to take legal action against the record company the result of which is bootleg pirates selling our music (often in lousy visual and sound quality) worldwide.